Ghost Chasers humble beginnings started in 2004 when Claire Walker and Michael Smith decided they wanted to discover for themselves whether what they saw on TV was indeed true or just faked, when one cold November night started their journey of discovery at a location near Paull were the team stayed for over 12 hours raising money for BBC Children In Need Appeal. The team differ from most groups as they do not use the talents of mediums but relies on a qualified parapsychologist to quantify their results. As Michael Smith, founder of the team explains in his book ‘This Haunted Isle’, "Mediums do not exist as all you need to know is how to cold read someone and have a general understanding of psychology." Darren Brown has demonstrated this himself. 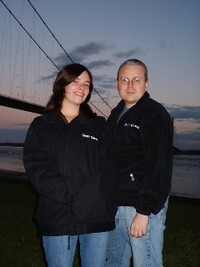 Michael and Claire have built up the reputation the team has today by offering an unparalleled experience, as after their experience at Paull they then organised their first public paranormal event at the legendary Galleries of Justice, Nottingham in 2005 and still do these Paranormal Experiences. JOY FM, a radio station in Melbourne, Australia, invited Michael and Claire to talk about their experiences each week to Jared and the Captain and it was around this time they became involved with BBC Radio Humberside when David Reeves presented The Late Licence, inviting Michael as a regular guest which led to the BBC Hull being investigated LIVE on air on Halloween! The team continued to go from strength to strength being covered in many local and national newspapers as well as being featured in the premier issue of Paranormal Magazine and more recently being filmed by a Channel 5 film crew.